Project Outcome for Academic Libraries is a FREE online toolkit designed to help libraries understand and share the impact of essential library programs and services. Based on the model developed by the Public Library Association (PLA), it provides standardized surveys, an easy-to-use process for measuring and analyzing outcomes, and the resources libraries need to leverage their results to effect change in their institutions and beyond. The full toolkit will launch at the ACRL 2019 Conference in Cleveland in April, but you can sign up now and get a sneak preview of the surveys and resources! When the toolkit goes live, all registered users will automatically receive access. Project Outcome for Academic Libraries is free for all academic and research library users, as well as library school students, in the United States and internationally. If you are not affiliated with a library, you can still sign up and receive access to the resources. The surveys measure these service areas. The toolkit includes both immediate surveys, designed to be distributed immediately after a program or service is completed to understand its impact, and follow-up surveys, for use 4-8 weeks after a program or service is completed to help libraries understand if patrons have changed their behavior or continued to benefit as a result of the program or service. Resources (available now): Project Outcome provides registered users with a variety of training resources, including outcome measurement guidelines, best practices, case studies, and more. Survey Management (available in April): Libraries can create and customize their surveys, enter and track survey responses, and download their raw data all in one place. 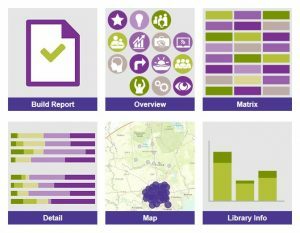 Reports (available in April): Ready-made and customizable reports make it easy for libraries to quickly share their results and advocate for their programs and services. Data Dashboard (available in April): Interactive data dashboards help libraries easily analyze their results. Academic libraries can compare their results across their institution, Carnegie Class, and nationwide. At the ACRL 2019 Conference in Cleveland, ACRL staff and members of the Project Outcome for Academic Libraries Task Force will offer five one-hour workshops throughout the day on Friday, April 12. Workshops start at 8:30 a.m., 10:30 a.m., 1 p.m., 3 p.m., and 4:15 p.m. No advance registration is necessary. Not attending the conference? We will offer a free introductory webinar, “Outcome Measurement Made Easy: Project Outcome for Academic Libraries,” on Tuesday, April 16 (register here) and again on Tuesday, April 30 (register here). Join us to learn about how your library can effectively use Project Outcome and ask any questions you may have. Don’t forget that you can also host a workshop at your own conference or event – read more here.